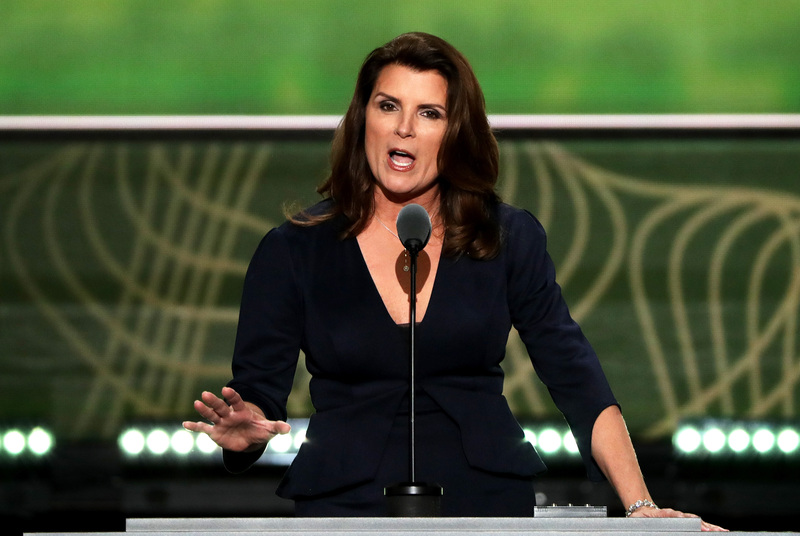 Kimberlin Brown's RNC Speech Made Hillary Clinton's Campaign Sit Up And Say, "Lol, JK"
One of the least-believable messages shared at the Republican National Convention came from a former soap opera star. RNC speaker Kimberlin Brown, formerly of both The Young and the Restless and The Bold and the Beautiful, headed to Cleveland Tuesday to endorse Donald Trump for president. Why? She argued that Trump is the best presidential choice for working women. And yes, she was serious. That left the Clinton camp with just one option: to respond with reality. Hillary Clinton's campaign shared a Donald Trump video about women, proving that he simply isn't a good choice for working women. We take care of our families, work inside and outside the home, pay the bills, manage costs at home, take care of our parents, all focused on one thing: securing the future for our families. That's all sensible and true. But in her eyes, the way to secure the future of her family is to vote for Donald Trump. But would Trump help secure the future of the average working woman and her family? Probably not — at least, not if a family includes children. Clinton's Twitter team released the perfect video in response. Writing, "Yeah, Donald Trump has been a real gem to working women," the tweet shows a video about Trump's views on pregnancy. The video starts with the title "A Message From Your Possible Next President." Then it cuts to old news footage. In an October 2004 interview with NBC's Dateline, Trump has some choice words to share. "Well you know, pregnancy is a wonderful thing for the woman, it's a wonderful thing for the husband, it's certainly an inconvenience for a business." He goes on, "And whether people want to say that or not, the fact is it is an inconvenience for a person that is running a business." That is clearly not a good attitude for working women, especially given that the United States is the only developed country that doesn't require paid maternity leave. The best way to help women would be to require paid maternity and paternity leave. But blaming pregnancy? It doesn't sound like a good way to "secure the future of our families." Brown, of course, doesn't see it that way. She's focused on issues focusing small business owners, like the Affordable Care Act and trade deals which benefit her avocados. But when it comes to real issues working women face, Brown — and Trump — just don't have a clue.